Finally, Protection from Seamless Conversations! | Come on in! Finally, Protection from Seamless Conversations! – Come on in! Finally, Protection from Seamless Conversations! Do you enjoy talking to more than one person at a time – but can never get a word in edgewise? Do you wish people would stop talking for JUST 2 FREAKIN’ SECONDS so you can be heard? ZIP IT – Extra Strength for Introverts® silences non-stop talking. 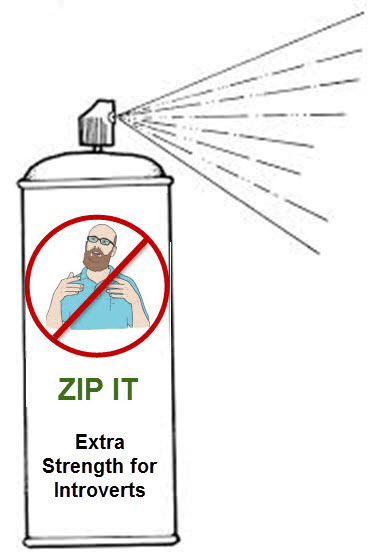 Simply spray ZIP IT at the offending yakker. Then say what’s on your mind. ZIP comes in two strengths: Clam Up and Put a Cork in It for family get-togethers. I’d like two cases please!